Now that the weather here in GA is finally starting to cool off I've been inspired to do some baking and cooking with "fall ingredients". First up on today's agenda are Pumpkin Chocolate Chip muffins. I found a recipe on Epicurious and plan on altering it just a bit - no raisins or pumpkin seeds and adding chocolate chips and walnuts. Why keep the healthy stuff when you can add chocolate to the recipe?! 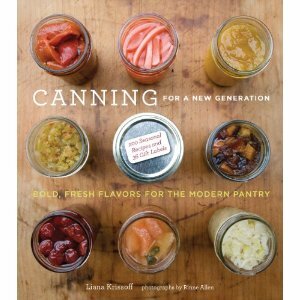 I'm also really excited about this book: Canning For a New Generation, by Liana Krissoff. We had her in the store the other night to do a book signing and tasting with some of her homemade goodies and oh my gosh they were good! She is also super sweet and has the cutest little girl. I've already decided that my first canning attempt will be her recipe for Spiced Apple Butter. I'll also be making homemade biscuits to put the Apple Butter on. Another thing that works really well in pumpkin muffins is a bit of cream cheese, stuck in the middle of the muffin after you've formed it but before you bake it. Just a suggestion - not that there's anything wrong with chocolate! Oh Orla, I love your work.